Can Modern Science Predict the End of the World? I am a scientist and a realist. I don't believe in fantasy or folk tales. That being said, I want to seriously investigate the Mayan Calendar Prophecy of December 21st, 2012. Aside from spending all of our money and maxing out our credit cards, there is little we can do to prepare for the end of the world as we know it. The Mormons predict world famine and they have a tenet that instructs them to prepare a pantry of food that will last a year at least. Other religions and cultures have predicted plenty of world's end scenarios. Perhaps even your own beliefs cause you to give some credence to world wide disaster and downfall of the human race. Well, we shall see. Since I have studied the Aztec and Mayan culture for many years as well as having practiced scientific principals for over 30 years, I have been asked many times to explain the 2012 belief of the world ending predictions of the Central American tribes. It's pretty scary, so hold on to your seat. In the photo at the top of this hub is the pyramid of Kukulcan. Twice each year, during the Spring and Fall equinoxes, the sun shines on the corners of the pyramid in such a way as to cast a shadow in the form of a serpent slithering down the steps. At the bottom of the steps are two large serpent heads. There are 91 steps on each of the four sides of the pyramid (totaling 364) plus the top platform giving us 365 to match the days of a solar year. At the top of the platform are the rattles of the serpents tail. Obviously, it was important to the Mayans to leave us a reminder of the great Kulkucan or the Feathered Serpent God. There is no other structure on earth that is more perplexing than the Temple of Kulkucan. The pyramid is over 1,000 years old and has been oriented so precisely that it continues to baffle engineers and architects of modern times. It is astronomically aligned to cast the serpent's shadow at the equinoxes each year and other celestial alignments are sprinkled throughout the community of Chitzen Itza. Alignments that even the Egyptian pyramids do not seem to possess. Certainly the pyramids of Giza are larger, but Kulkucan's temple and the surrounding structures are literally a star map set in stone. The ball court at Chitzen Itza is a miracle in itself. The whole structure was meticulously aligned with the dark rift of the Milky Way galaxy. The Mayans considered this rift to be the dark road to the underworld. On December 21st, 2012, the ball court will once again align perfectly with the rift directly overhead of the long axis of the court.This event happens every 5,125.36 years. How do you go about aligning a permanent structure that is valid every 5,125.36 years? The ball court also possesses some odd acoustical properties. One person standing at one end can whisper a phrase and the person standing at the other end of the court can plainly hear what is being said. The distance between the two ends of the court is as great or greater than a football field. I have personally tested this acoustic property. It's kind of spooky. Is it possible for us to even imagine the technical ability of a civilization over 1,000 years ago being able to align all of these things so eloquently? Upon my first view of the temple of Kulkucan, I looked around at the Mayans working there and again at the pyramid and at the other structures and my only thought was that these small people who continue to live in thatched huts could not possibly have built these immense structures. And why would they do so? The dense jungle provides for them now as it did a millennia ago. They had no use for these structures then and they have no use for them now. So who built them and why? 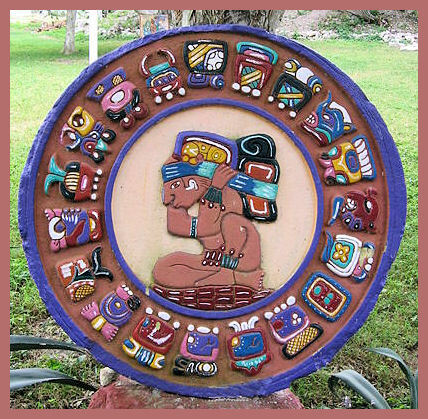 The Mayan calendar is the original precise calendar adopted by the Toltecs and Aztecs. 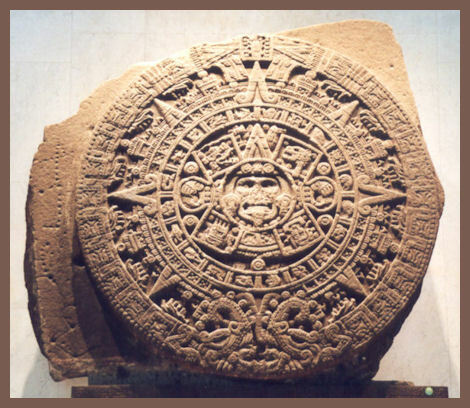 The Aztec Calendar stone weighing a couple of tons is one of the most famous calendars in the world. It varies from the Mayan calendar much like a Canadian calendar would differ from a U.S. calendar. Believe it or not, it is actually three calendars! There is the solar calendar which is much like our 365 day calendar, a religious calendar, and finally, what is known as a long count calendar. The long count calendar is the one that exists for 5,125.36 years. Each time the long count calendar comes back to the beginning, a new age begins. According to the Mayans, we are in the fifth age of mankind as determined by the long count calendars. Now, this long count calendar ends the fifth age on December 21, 2012. Does that mean it's the end of the world? No, not likely. It does mean that another long count calendar will start its 5,125.36 year journey and the sixth age of man will begin according to the Mayans who were undoubtedly super smart about such things. 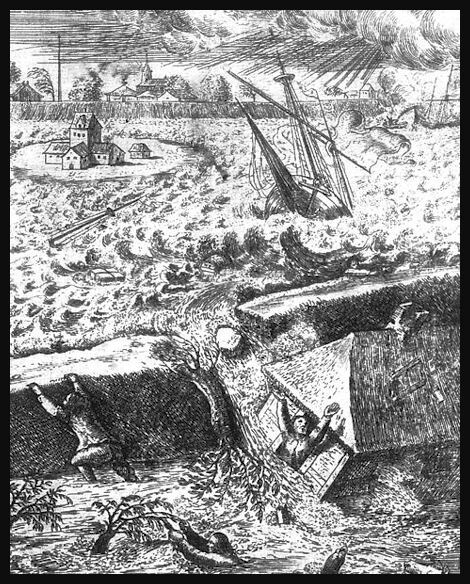 Parts of the long count calendars have coincided with world wide disasters before, like the flood that destroyed most of the world as they knew it then. Another long count calendar ended with the destruction of the dinosaurs some say. Some Mayan legends depict the earth ending in great earthquakes or world wide fire. Many researchers have tried to align the long count, religious, or solar calendar with Nostradamus and other prophets. Sure some events occurred and appeared portentous according to one calendar or another. The Mayan calendar accounts for time periods that correspond to the stars, the sun, and the seasons which is what makes it such an accurate calendar. The Mayans were the first and only culture to use three separate calendars that mesh together like cogs in a gear system. The Mayans were the only fully literate culture of the western world. For sure, the Mayan calendar is brilliant in its design and only the Mayans realized the importance of the integer called zero. The long count calendars always start out as 13.0.0.0.0 reading from right to left. This Mayan long count will reach 13.0.0.0.0 once again on or about December 21, 2012. Basically, this date means that all three of the Mayan calendars will once again be synchronized at that one date and a new era will begin. There are some events predicted to affect the earth in the coming years. These events may actually be spectacular and even tragic. It's possible that one or another of the events will somehow destroy the world as we know it today. But the Mayan calendar doesn't really predict events, it's only a calendar by which events are measured. The sun will enter a "solar high" period of sunspots or massive storms that eject tons of material directed toward the earth. 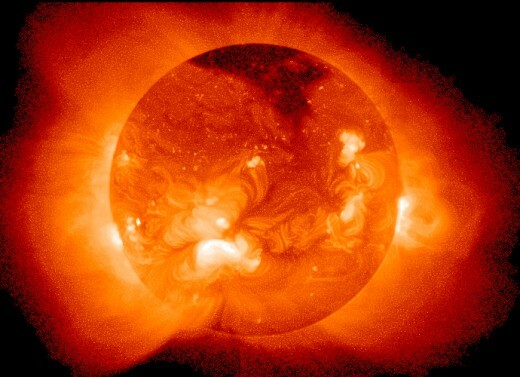 These are called Coronal Mass Ejections or CME's. The last time our sun was in a solar high period, the magnetic poles were very affected. This period of solar highs will peak in 2013 according to NOAA. A severe CME that hits the earth dead on could knock out all electronics, power lines, satellites, etcetera... causing severe chaos that could possibly result in many lives lost. The super volcano of Yellowstone National Park could erupt and create a "nuclear winter". Many lives would be lost, crops could not grow resulting in world wide famine. Scientists predict that this event is seriously overdue. Reversal of the poles. Some scientists have stated that this has happened in the past. They say the earth will actually tip over and north will become south. Whether this will happen rapidly or slowly, no one knows. Certainly it will devastate life as we know it today. Most of the oceans would spill over on to land with enormous tsunamis. Earthquakes would be unimaginably powerful. I'm hoping against hope that this does not happen in my lifetime. The giant asteroid will hit. Some very big ones hit Jupiter just a few years ago and caused massive changes on that giant planet. 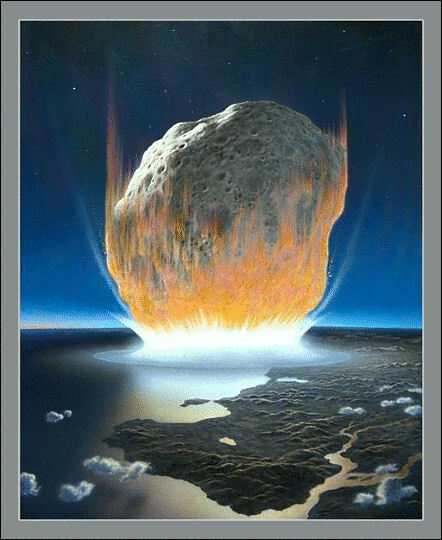 It will only take an asteroid the size of a small island to wipe out earth as we know it. We will go the way of the dinosaurs. Again, I hope this does not happen in my lifetime. World wide pandemic of some virus. The flu of 1918 to 1919 killed as many as 40 million people. This was considerably more than the Black Death Plague of the Middle Ages. The Spanish flu affected nearly every man, woman and child on the planet. That flu killed more Americans than did the Great War - WWI. New super bugs are mutating even as we speak and one could seriously put a dent in the world's population. No more clean air or water. We could quite easily poison ourselves to death. Pollution is a world wide problem predicted to affect future generations. Without a workable plan, the earth could become a desolate waste land of water devoid of life and undrinkable. Since water is the source of all life on our planet, we could very well need a solution soon. Perhaps as soon as December 21, 2012. We could blow ourselves up. We have the nuclear weapons to do so. Wars of religion and/or politics could convince someone with their fingers on the bombs to go ahead and just wipe out the enemy. News Flash - They're thinking the same thing in reverse. We are their enemy! Personally, I can't figure out who's god is better than the other gods. Or even if there is a god. Doesn't matter. What matters is, What is that guy thinking when he has his finger on the big triggers? Which end of the world scenario seems most likely to you? It is not widely known that the Mayan people of ancient Central America used the Yin-Yang symbol, despite male and female polarity being the cornerstone of the Mayan view of world creation. The entire Mayan social structure was based upon a form of mastery of one's own energy, where the "Serpent's Energy" that dwells in the root chakra was raised up the spinse to the crown chakra. Comments, Do you think the world as we know it will end soon? How? It is with me. Can't get away from it. I shall endeavor to use and enjoy the cosmic energy. Happy New Year! YES! my belief also, it is "the force" that inspires and enlightens all life. May the force by with you!! You may be referring to what I call the primal energy. It is a physical energy that binds everything together. A popular movie I could mention called it "the force". It is a very real thing and apparently only some people are actually aware of it. The world is so much more interesting when one views it through different lenses, not just this or that, but this and that and the other. That is metaphysics. It is a multidimensional parallel universe of time, space and dimension where quite everything is possible. It keeps me alive, this subtle energy. I can't imagine my world without it. You nailed it - I'm a Realist through and through. I just don't 'get' the metaphysical. But I do understand infinity. In a very real way. HubPages tries very hard to discourage promotional links in comments, so please don't leave them here. I am familiar with precession and the cosmic significance of the December 21, 2012 date. But you are turning it into some "spiritual" thing which it is not. No more so than the phases of the moon. It is all an observable and predictable process. There is nothing magic about it. As for numerology - you're kidding right? What the Mayans had was a December 31, 1999 scenario. How many people thought that date was the last one? When are people going to realize that a date on a calendar is comparable to a marker on a ruler. Neither one is prophetic. One can also compare dates to an odometer in a car. When it's 999999, the next day it's going to be 000000. The car won't blow up, why should the world? Ok, now where were we? I may or may not be her to look for what may or may not be someone's money. Well, while you are or are not here or there, would you look for my money? It seems to have disappeared. Or perhaps, I never had any to begin with. I can't recall as my brain seems to have shrunk to the atomic level. It is up to me if I am still here. At least I still have that right. And I insist that I may or may not be here. Don't mess with me being here or not here. nicomp, I have been trying to respond to this comment from Mexico. Apparently, the internet world ended down there as nothing seemed to work. Obviously we are still here, but I was there while you were here and now I'm here but I really don't know where you are. As soon as I recover from my vacation, I'll check to see if I am really still here and not still there. I'm still here... or am I? Austinstar, Very interesting, insightful and informative hub. Interesting that you wrote this at least 2 yrs ago and tomorrow is the "big day":) Great work! Dang those trolls. Maybe the Mayans have a way to deal with them. I'll ask around while I'm there. Yeah, I had to make a new account because they kept telling me that I didn't know who I was adding as friends. It got so bad I just made a new account. So, yes Happy Mayan New Year to you too! I have been reading your questions and the answers that you are getting on a number of topics lately. I am enjoying them. Hahaha I am a lurker for now -until today. I don't believe all the mumbojumbo that is out there and the scare tactics people use in these silly things. People need to think rationally. People believe that each day is a new day when the fasct of the matter is there are no new days. The Earth cspins on it's axis...no beginning and no end...no new day or now new night. I just thought that I would stop by and tell everyone that WE ARE STILL ALIVE and kicking. Nope, previous comment deleted. No plugging. I don't care if it IS the end of the world. To see funny video on the Mayan Apocalypse, go watch Jay Leno and David Letterman. Can I plug my stuff here? Well, epus, I am going down to Maya territory for the 21st. I will see first hand what happens on the winter solstice at the end of this long count calendar. I don't expect the end of the world, obviously, but I do expect to see some amazing astronomical alignments in the ruins! I'll be taking lots of photos, so stay tuned. Great hub. I am now looking forward to witness the writings on this hub. 9 days from now, things may take place. I still believe it won't happen because God only knows the time of the end of the world. Why worry when we can pray. 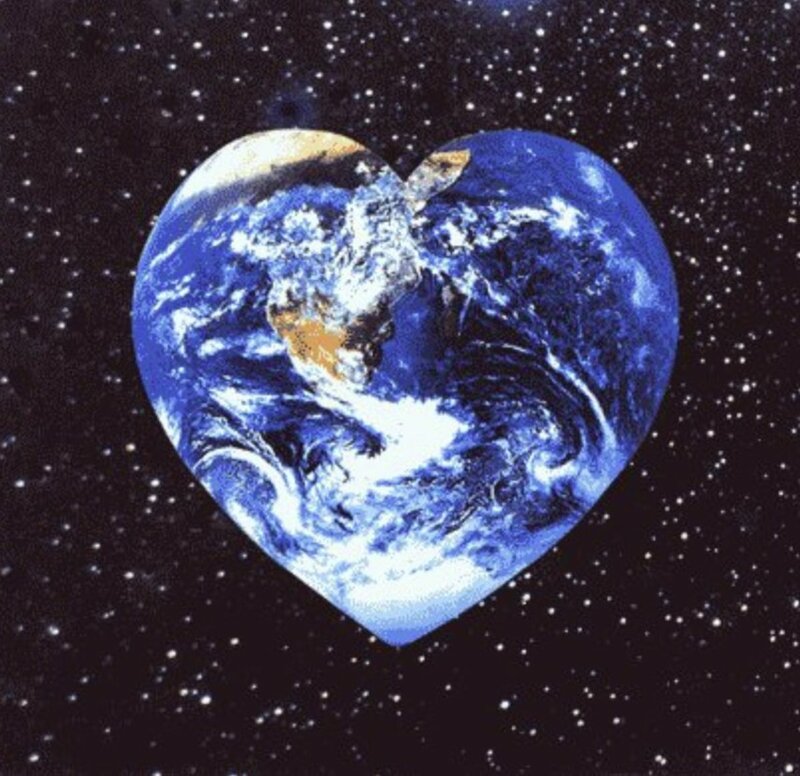 In yahoo news, I have read about some scientists believe that our Earth is livable for 100 billions years. I wonder if you guys could still live to see these coming years. The flu is probably the correct end of the world answer. Or it will be some other super bug. Thank you for commenting! I am 81 years old and I remember my Uncle Haris Finley talking about the Flu in 1918 killing 40 plus million, he was in World War 1 and he said they had to stack the dead soldiers up like stove wood, they could not burry them fast enough... So I know for a fact that it is a deadly killer!!! Thanks, Rajan. I certainly hope the world doesn't end any time soon. You are right, no one can predict when the earth will fail. Very interesting read, Austin Star. I for one do not believe anyone can predict the end of the earth with certainity. We just got to weight & see. Voted the hub interesting and up. Actually, they did not overlook leap year. I have no idea who started that rumor. They accounted for leap years in their solar calendar. They also skipped days in their lunar calendar. I think everything eventually lined up in the religious calendar but it took thousands of years for this to happen. Didn't the Mayans overlook leap years in their calendar? I think their last day has already passed, because of that. You got that right, Darrell. Just like the dinosaurs. Looks like you CAN predict the future, John! Well, I'm going to stick my neck out and make a very positive prediction when the world will come to an end. It will be:- Either ON the 21st December 2012. Or, BEFORE the 21st of December 2012. Or, AFTER the 21st of December 2012. Over a nowt! No one knows or can possibly figure out how the earth will end. There are way too many variables. The only point that I would like to make is that we should live our life every day as if it were our last day on earth. Everything changes. Even every cell in our bodies are replaced every so many days. We are constantly growing or shrinking and nothing can be done to stop that process. We are simply along for the ride. Do not spend time worrying about what might happen. Just enjoy what is happening right now. The best thing you can know in your mind is that "Life goes on". The largest spaceship ... wait for it! is 240 klms wide. Researchers calculate they will arrive by end of 2012. (End quote). How daft is that? Next please! According to UFO prophet Billy Meier, increased environmental destruction, famine and even the speeding up the rotation of the planet will intensify dramatically by the year 2012. (End quote). p.s. Some of those will actually take place. And the next! Please welcome Theresa J Thurmond Morris. 'We need to have a declaration for all earth to work together as one planet in one galaxy in one universe among metauniversities. December 21st 2012 is D-Day and we might as well get used to the change...... The space-time continuum is running and the date set to turn over on the big universal clock is December 21 2012. Make no mistake that this is when the 'BIG LISTED LIGHT' in our solar system, the sun will shine through the universe at our center, which is a BLACK HOLE' (End quote). Phew, what a relief! Call the next witness please. Let's hear now from the Buddhist Tibetan Monk who sees extra terrestial powers saving the world from destroying itself in 2012. He has this to say:- 'ET powers are watching us every step of the way. They will intervene in 2012 and save the world from self-destruction' (End quote). p.s. Ang on a mo Mr Monk, most people are NOT saying this is a 'Self-destruct' plot. Isn't it supposed to be a 240 klm wide spaceship? Quite a mixed bag there. Help, the world is going to end in 2012.... No it's not says the Monk man. Oh yes it is says the SETI report.. No, no, no says the Niburian Council. The who? Ah well now, this is what we call the multidimensional off-world council whose members are connected to the planet Nibiru. The Nibiruan mission is to prepare humanity to take their rightful place in the greater galactic community' (End quote). Oh well, back to the drawing board. Beam me up Scotty and all that jazz. My molicules are in need for some food. The polar ice caps may melt, but I don't think God has anything to do with it. It's a matter of physics as usual. AUSTINSTAR: You've done a fine job by explaining things in reasonably simple terms that I may at least be able to try and understand a little deeper. I have to confess, it's still too deep. All I can think of at the moment is 'Roll on the 12th of never' How does that sound? Thanks for taking time. Oh, I forgot to answer the question about investigating the Mayans. In my current configuration (atomically), it amuses me to do so. Whether I do or don't is inconsequential. I am just currently enjoying my time as a conscious being. Perhaps in a billion years, I will enjoy being a real star. Who knows? I do not. I just know that I have always been a part of the universe and I always will be. John, I realize that you do not understand this concept which was never taught to you. In fact, just the opposite was instilled in the brains of most of us from birth. Until you are capable of understanding the concept of all things having been here for eternity, I cannot explain more. When you think of birth, I think of the coalescing of atomic structure into what may become a human, a dog, a star or a mountain. Death is just the opposite, the atomic structure moves on and coalesces into another form. I hope that you can at least see that we are all connected to each other, to each living thing, and to each "dead" thing. Atomically and infinitely we are all the same. We also are connected and related to stars, mountains and all things in the universe. There can be no separation. 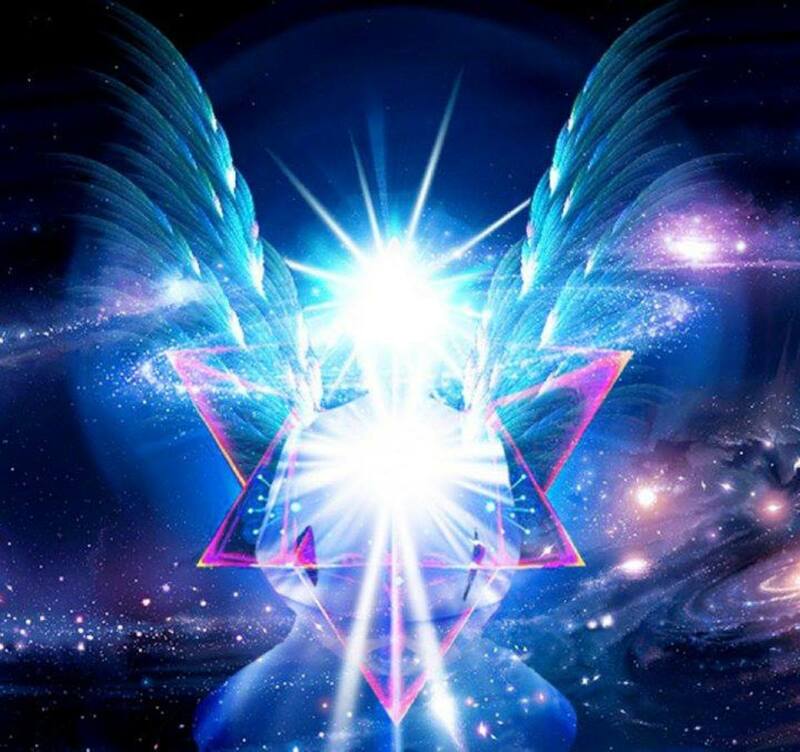 Yes, you and I have always been part and parcel of the universe, we are just as important today and since we cannot "die", we will remain an infinite part of the universe in one form or another. AUSTINSTAR: Again I thank you for giving some further insight to my questions. You have put it to me 'That something cannot come from nothing, therefore those somethings have always existed' Unquote. If this is the answer to the entire universe - as you said earlier - then it has to include all that is within the universe as well simply because the universe is occupied and inhabited with an ever increasing population of animal, vegitable and human race. Surely there has to be a time of birth and/or conception when things are brought to existance. This has always been my experience, honest! Your explanaition fails to be of assistance to me when I consider how then did mankind come into existance? Was the human race always there within the universe which was always there and has no beginning or even an end? Am I given to believe that there is no such thing as creation? 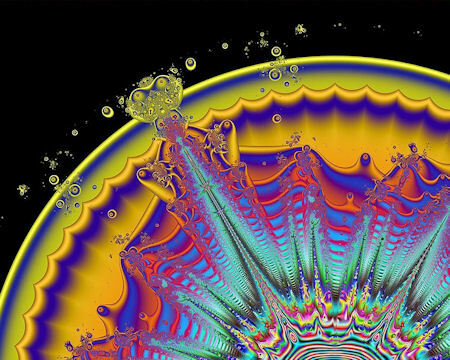 If this were so, we would all have to accept that our brains came about merely as a result of some random shuffling of atoms and molecules which dictate our very thinking and behaviour; simply because we were always here under the auspicies of infinate progression. Well then, I can now put it to you like this. For what purpose is there an investigation to the end spoken of by the Mayans, and their calendar predictions, when you say there is no end.....or beginning. That's what you did say; No alpha, no omega. Why bother to devote all this time and effort to investigating something that don't even exist? I remain baffled and confused by something which defies the logic, even contradicts the simplicity of nature combined with creation. cannot believe that I have always been in existance along with the entire universe. That cannot possibly be right. Do you have an explanaition for the creation of animals, or were they also there from the beginning along with the universe. I have to ask these questions. Please provide some answers for me. Many thanks. The universe did not COME FROM anywhere! It has always existed. I thought that was implicit. Obviously not. Have you ever heard of the concept of infinite regression? or infinite progression? How about understanding the concept of infinity? Simply put, there is no beginning, there is no end. There is no Alpha, there is no Omega. In physics there is a postulate that something cannot come from nothing. Therefore, the somethings have always existed (infinitely). Why do you believe things have to have a beginning? They don't have a beginning, I can assure you. Neither the universe nor God just suddenly appeared out of nothing. That concept is absurd to me. AUSTINSTAR: Many thanks for taking time to answer my questions. It's always interesting to hear the views and opinions of what others believe, and why. If you hadn't mentioned that you were an atheist I would not have had this chance to enquire, and I do thank you for that. It's sort of scare monger tactics when there's so much publicity on the end of the world. That crackpot Harold Camping recently made a fool of himself and his followers. But as the world watches on and hears so much silly talk from those who confess to be Christian preachers, it makes a mockery out of religion especially when there are those who don't even believe in a religion or any kind. I have another question which brings me back to square one again. If the universe has always been here, where did the universe come from in the first place for it to be here. Over to you. John, you have asked the age old question of "Can you tell me please, who or what created this world?" My answer is that the universe has always been here. There is no beginning that religionists are always searching for. It begs the question, "Who or What created God?" The answer usually given is "God is outside of space and time and in effect was always here." This is the same answer that I see for the entire universe. For more info, please see my hub on "Where do we GO when we die?" The answer is, we don't GO anywhere. Our atoms are currently existing, have always existed, and always will exist. The forms change, but the substance stays the same. I know your religious beliefs are not going to change and that doesn't matter since we really have no control over the physics of the universe. My only point for this hub is that Cosmophobics are fixated on the end of the world scenarios and I find that amusing. There is absolutely no way to predict the end of the world since, in fact, all of the matter contained on this world will simply change forms. I never "ends". AUSTINSTAR: That's most interesting what you say there. Maybe you could be the one who can answer just one big question I have been asking for some time. Can you tell me please, who or what created this world, the trillions of stars, planets, spiders, animals, human beings, cats n dogs, formed the contours of continents, the oceans, clouds, big bangs, small bangs, natural seasons which develop year in year out. Who did this please. And, it would be helpful to me if you do you have concrete evidence that there is no God. I'b be interested in this. What I don't understand is; All that is going on at the moment throughout the world has actually been prophecied in the Bible, so how on earth can it be wrong? A deep mystery this is if Bible prophecy has no credence even though it's writings are spot on. Or perhaps you meant to say; 'Has no personal credence' rather that speaking in general terms. The heading at the top of this page includes the debate on 'END OF THE WORLD' and not just the 'MAYAN PROPHETIC CALENDAR' But if this hub is dedicated solely to Mayan matters, then I take your point, I have no say on this hubpage. All things considered with an open mind will be confined to the proverbial scrap-heap as there is now no place for alternatives here. Many thanks for your observation and I look forward to your reply. Take care! This hub was written to investigate the Mayan Calendar. As an atheist, I put no credence on biblical prophecies. I actually don't give any credence to other end of world prophecies either. Scientifically, the end of the world will not mean anything one way or the other since the universe will continue to exist. God has nothing to do with it or this hub, but thank you for your comments. Hello Austinstar. The point here is to provoke some alternative thoughts to the subject which relates to the 'The end of the world' This is what we are debating here. Indeed, there is so much in the Bible regarding end times and last days. Sure, there is a place for the Mayan writings, but because a lot of fear has been generated over this 'End-of-the-world' prediction for 2012, we should all be able to look at something which at least can be relied upon, and that is the Word of God. We cannot simply ignore what is prophetically written, and ordained by the creator of all things. Are you with me? Sorry if I caused some confusion with my comments, but there is another 'end of the world' series of events not to be overlooked which justifies a look into. Hope this helps, and thank you for asking! I'm not sure what your point is here, John. Keeping an open mind obviously! I guess it's safer that way because who will be able to detect the correct answers to it all. Here's another angle to consider; after all, if the Mayan tribe are only possibly right, that means there's at least room for other potential considerations. How about a word from the creator? Please welcome the Supreme, Lord of all, the Majestic, The Almighty, El Shaddai, The Alpha and Omega...aka God! Jesus had been chatting to his disciples about the destruction of the temple, and giving them some clear lessons regarding 'Signs of the End Times' We continue now at Matthew 24: 3-4 and this is the commentary. Signs? What signs? Have there been any? Have there been many? What ever next? One thing is for sure, the world will NOT come to an end at the end of this year. It may be the end of the beginning - think about that one - or, it may even be the beginning of the end. But no way is the earth going to expire on December 21st 2012. Who says so? God says so! End of debate. Have a g'day all. Voted up, useful, and interesting. This is a very well researched and written article. Very good job. Needless to say, I will be etchy. I don't think it will happen, but who knows? The Mayans were well ahead of the times and they knew the universe very well with little technology. It would appear they knew something to this matter. Very interesting. I really enjoyed this article and shall follow you from here on out. Best wishes and talk to you soon. I agree with breakfastpop about Obama. As to the 2012 prediction, I believe the Mayan Calendar is only a Calendar; however I also believe that there are many eventful and changing events coming to our planet, some of which has already happened. Great article, and the of comments were also great. I believe the Mayans are on the money. New updated Mayan designs now available at my CafePress store! .........they predicted in what year their civilization would be overrun by foreigners coming from over the seas. See - is it a surprise to you that my birthday is 12 / 21? My friends say that just figures:-). Loved this - that is why I wanted to see Chitzen Itza so bad! I have watched several interesting shows on the discovery channel about this topic. The Mayans were incredibly smart - I believe there is something to it. Then - I laughed through half of the comments! Omg! I love your responses:) Fantastic! go to machu picchu, its one of the coolest places on earth. Hi Neil, no I haven't read much on the Peruvian tribes. 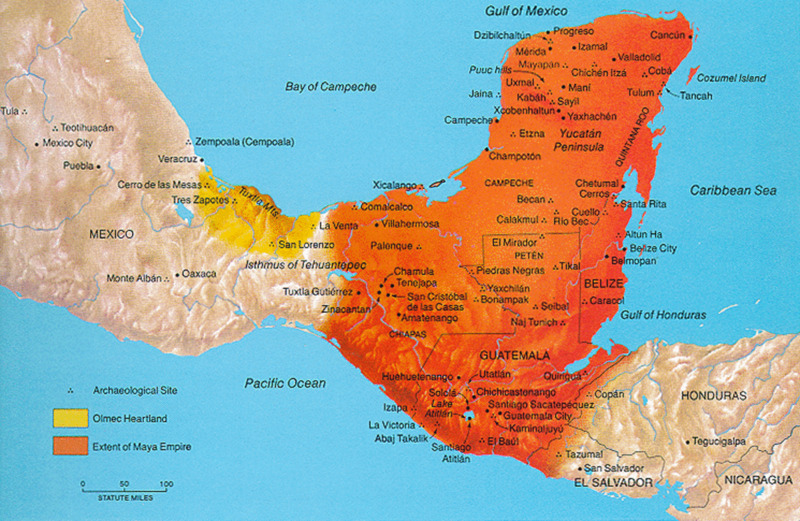 I got as far as Central America and was just overwhelmed with the richness of their history and knowledge. It's enough to consume my educational life. But I did start out to study the Incas and Sacsayhuaman and the fabulous Macchu Picchu. I would love to travel to either site before I die. I'll be on the lookout for Keepers of the Ancient Knowledge. Thanks! There may be some influence to the world as we know it due to the planets lining up. Science has proven that planetary alignment will happen on that date. The moon influences tides and emotions... so why not the planets? What that influence will be - I look forward to experiencing. A random phrase - When did you graduate from freshman earth science? Yesterday? I sincerely wish that you make it to sophomore earth science class. But what you really need is some intense English classes! Did you know that computers now come with spell checkers? That will help you out a lot. Apparently, your mama never taught you manners or etiquette, but it's not nice to scientifically criticize a hub based on conjecture and supposition. But you did make some interesting points, so I'm letting your comment stand. Thanks for contributing. Ok let me tell you something. This is completely fake. Alright? first of all, the poles cant reverse. but the magnetic poles can. This has happened in the past. the magnetic poles reversing has happened and it can be measured at mid ocean ridges where the magnetic domains have switched in the molten iron in the past. As far as we know this didn't effect anything at all. Second of all, even if the world did "flip over" as you say, earthquakes wouldn't change in intensity because they are tectonic. they have hardly anything to do with gravity or the poles. Third, I noticed that you used the word "could" far more often than "will". And about Yellowstone erupting and it being "overdue"; you dont know that, no scientist knows that for ceartin. Volcanic eruptions are among the hardest natural phenomena to predict. Sure it will erupt someday. But according to the prediction of how long we are overdue for one, weve been overdue for about 40000 years. Dont you think it would have happened by now? Get your facts straight before you ramble on the internet about stuff you dont know. I learned all of what i just put from a freshman Earth Science class. Oh that should be interesting. The Mayan had three calendars. One was based on the solar year, one was based on the lunar year, and one was based on the Venus year. So each day had three separate names. 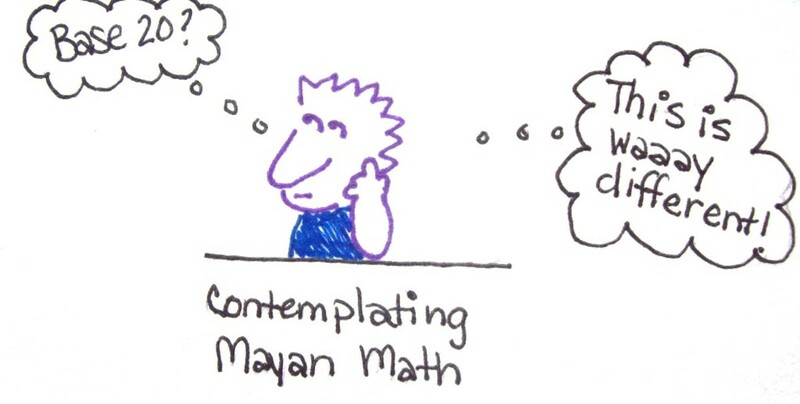 Even the Mayans do not agree on how to correlate their days, weeks, months, and years with ours. It's just a calendar, folks - for marking time. Like frogdropping said. I will do another hub some day on the Mayan religious rituals and their "predictions". Oh somehow they never mention the days in one year of the Mayan Calendar--it was over 600 days for One Year. That throws everything off by our standards and our calendars. Our calendar has been changed several times just in the last 300 years. The sunspots already have happened several time since the 70's and we aren't dead yet. Oh the big one was going to kill all of us. I also remember about some planet or big asteroid that was coming so close to Earht that everyone was going to die and it came and went and we are still here. What makes much of the predictions moot (however you look at it) is the fact that the Maya used the calendar to mark time, not as a means of predicting future events. They appear to have been foreward thinkers, in that they planned ahead (probably using common sense) in order to plant crops, maintain their culture and remain stable. That doesn't equate to prophesising. They certainly didn't foresee the arrival of the Spanish, nor the slow demise of their once great nation. And despite their sophistication, they were utterly brutal. Some of their religious parctices were horrific, both towards others and their own population. They also worshipped Gods that are akin to deities found in myth and legend. Were they impressive? Yes. Were they advanced in comparison to other cultures of their time? Yes. But then - so were the Egyptians. I'm planning on having to count the cost of Christmas 2013. Oh, I saw the report, but I also know there are Mayans today that do know the calendar, I've met them. Perhaps they do not understand how to correlate it with our calendar, but if they don't, then how can this guy? We may never know the actual correlation. There have been other theories from other folks too. It's like a man with two watches, he'll never know what time it really is! But Lela, not even the Mayans today know the true formula. Didn't you see this one on the news? It is all wrong as the original Professor who deciphered it miscalculated the math. No one yet can figure the proper dates for it yet. All the hubs, blogs, the movie and the horror of it all is now mute. Ralwus, but what if the guy's new calculations are wrong? I say ask a Mayan! I'm already planning an "End of the World Party" as I suggest on one of my hubs! Why not? We won't have to buy Xmas presents that year, so why not spend the money celebrating? Update. It is all wrong, the math was old and they never updated to New Math. LOL We have a reprieve. I think this is so hilarious. It would be enough to convince a sufficient number of them to make up a new cult of the new calendar, I'm sure. Awesome work. Very interesting scenarios. I wonder if we could make up a random calendar and observe that it lined up with two or more disasters throughout history. Hopefully that's not sufficient to convince people. I don't believe in any of those scenarios and like my calendar, at the new year I get a new one. 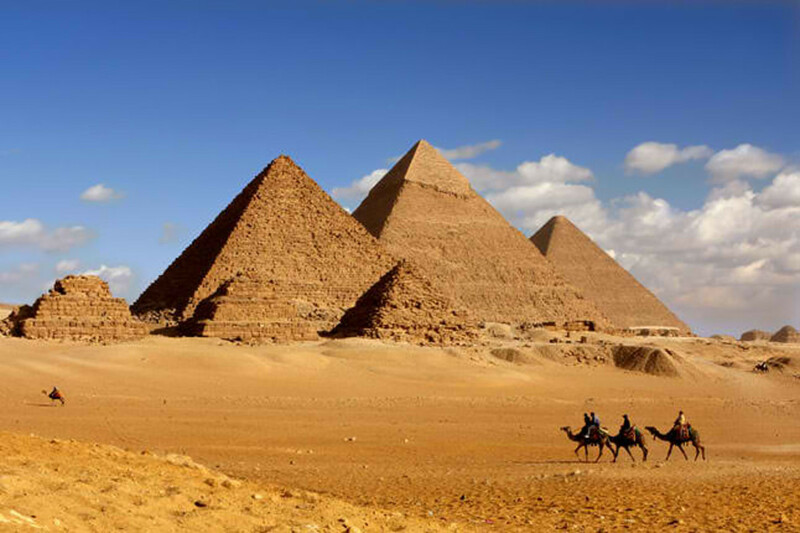 They did have great art work and someone else had to have done those pyramids, those short people could not have done that. If that happened and I lived through it, I would let people do what they wanted and stay out of the way. To try to stop people from that panic would only ensue more negativity and incite the riots even more. After all it's the end in these people's minds, can they be stopped? Not until they realize it is not the end and they calm down a bit. then we go from panic anarchy to a more controlled anarchy LOL which would be the dark ages but with a bit modernism to it LOL. good sci-fi movie lol. Smireless, scientists have predicted with some accuracy that our sun will burn out in 5 billion years, plus or minus a few thousand. Plan ahead! Great hub and thoroughly enjoyed. When we talk about the end of the world, we really mean the end of our world (human civilization). The world will rock on until the sun takes it out in a billion years or so. Sa'ge, no, I'm sure the scientists have put as much thought into power and polar problems as they did for the Y2K fiasco. Fortunately, that was mostly conjecture. We really do need people who can think about the future and plan for real potential problems! If all communication came to a stop and all power was disrupted, don't you suppose that anarchy would break out and looting would be a real problem as well as rioting and runs on supplies, etc.... It would be a world wide catastrophe! We would immediately revert to the dark ages. What would happen if all communication came to a stop and we were hit with solar flairs? 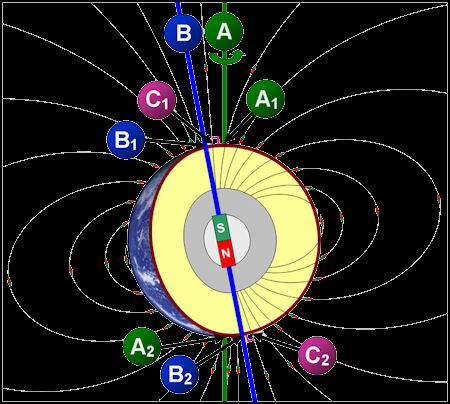 If there is enough of a shift with the planet then magnetic poles can shift and power would not be able to get fixed until the energy fields of equipment were changed. I may have said this wrongly but my brain is still groggy from sleep, I am sure you knew what I mean. Is Science ready for this? Have they even thought of or thinking this? Hi guys! Yep, the virus is probably the one we have to watch out for. Eat healthy, exercise, die anyway! That's my motto. Lela what a wonderful read. I am predicting right now that the world will continue on after the final day of countdown. 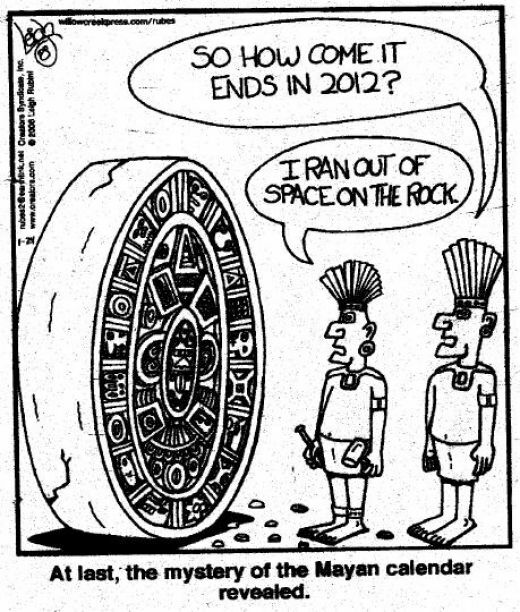 Even ancestors of the Mayans say that it's only a calendar not the end. Wow! The virus is winning. So I'm in a quandary. Do I turn toward self sacrificing for a better appeal to God or do I get a new bike and ride it more. Life is so complex! "our sun burns out in about 5 billion years or so"??? I've got to get a better sleeping bag! Shirley - That is my point exactly! But the end of our earth will happen when our sun burns out in about 5 billion years or so. 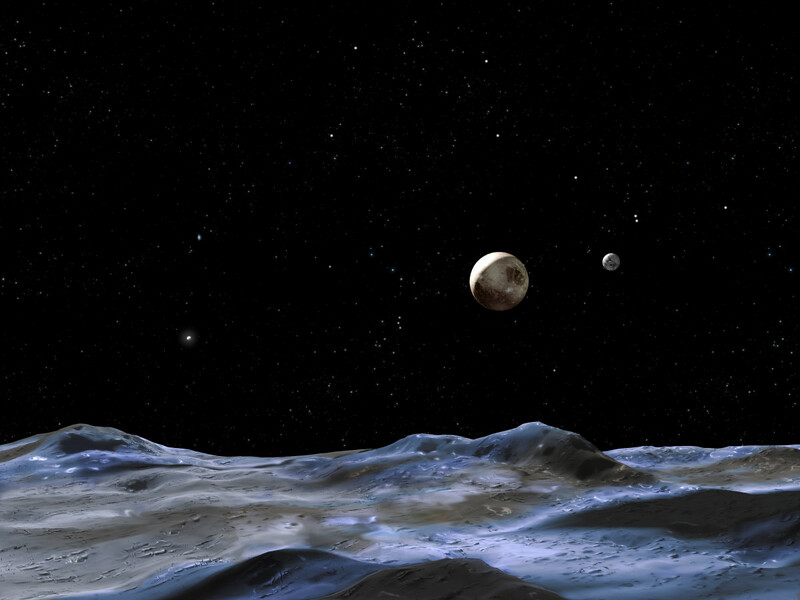 We will have to find another planet to inhabit by then. No one can really predict the end of the world. It may or may not happen. You brought out an interesting topic. Nice hub. Audrey, I'd rather see you trying to swim the giant tsunamis - you would make us all laugh at that! I am trying not to think about it to be honest. I think at this point in my life, I deserve a little head in the sand attitude....but I guess asteroid might be the 'way to go'....yikes! dr bj, I tried to prognosticate once and my hair got tangled. I'll look for some de-tangler just for you. Just a little oddity about the Mayan musicians - If the percussionist missed a beat, they killed him. They were perfectionists, those Mayans. Fascinating read, Lela, thank you. 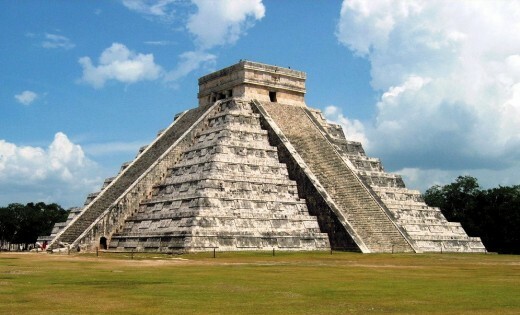 I have always been curious about the Mayan calendar, their structures and their predictions. Will be looking forward to more prognostications from you. Kenny - Yes, I'm pretty sure it's only a calendar. Gypsy - Well, we do know that we will stop breathing some day. That's a fact. But we will become another form of the great and venerable universe. BPop - I thought the world would end when G.W. got a second term. I was wrong. The wheels just keep on turning. Gus - I will do a hub about the Nazca plain and a place called Sacsayhuaman. And of course, that incredible city in the clouds, Machu Picchu. The Incans may have been the original beings on this planet. It's just astonishing what is down there. Howdy Lela - I have to vote with breakfastpop. No matter that... this was a very interesting and engaging article. It must have been fun for you during the storing up of your excellent knowledge. For a followup, Lela, think about tackling the likely origins of those advanced peoples of Central and South America - things like the Kon Tiki theory, etc. That would be fun to read, almost as much as was this article. Nice work! If Obama wins again in 2012, then there it is: The end of the world!